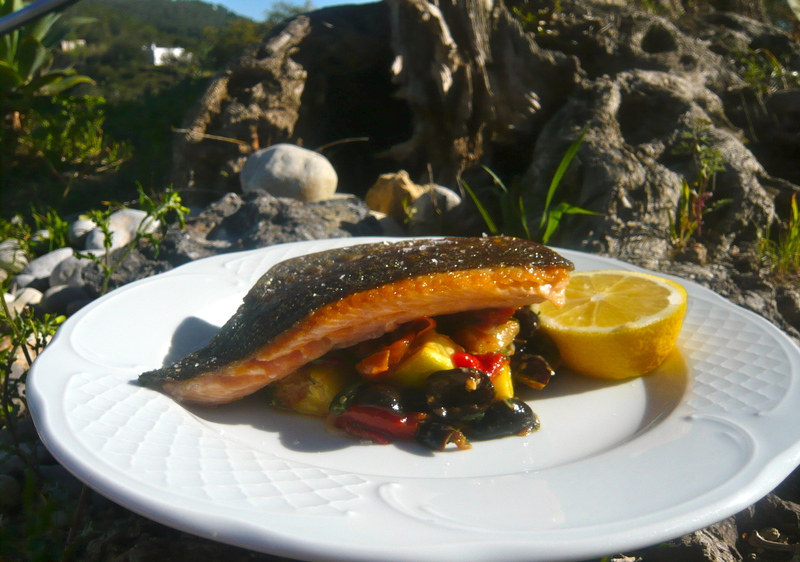 It is rare that I don’t put a sauce with fish, but the Provencal vegetables give the same context to this meal as a sauce, that being moisture and texture. This is one of those recipes where it doesn’t really matter if you don’t have one or two of the ingredients and for example, you can swap basil and parsley for thyme or rosemary. We are just trying to encapsulate that southern France feeling and that is done by using ingredients that are typically grown and produced in Provence. You can use any filleted piece of fish with or without skin for this, again I place a certain importance on pin boning, see chef´s tips for details or you can ask your fishmonger to do it, not saying he will as it is quite fiddly. Once you get into the habit it takes the eating of fish to the next level. Cut the aubergine and courgettes into 3cm squares, again take your time to make straight even cuts. Toss them separately in oil and lay the aubergines onto a baking tray lined with parchment paper. Cut the cherry tomatoes in half and lay them out next to the aubergines.Put the red pepper and the garlic bulb on whole and roast in a 200 degree oven for 20 mins. After 10 minutes take out the tray and gently turn over the aubergines and make some space and put in the courgettes and olives for the final 10 mins, use your instinct if it needs more time then give it, I just worry about the courgettes being overcooked and too soft. When cooked, put the roast pepper onto a plate and the vegetables into a bowl. This is a warm salad so don’t worry about serving it piping hot. Peel the pepper and cut it into a similar size to the rest. Thinly slice the spring onion into rings. Add the olives, capers, salt, pepper and a squeeze of lemon. Cut the roast garlic bulb in half through the middle and squeeze the paste into the bowl. Gently turn over the mix until it is thoroughly mixed being careful not to mash it up. 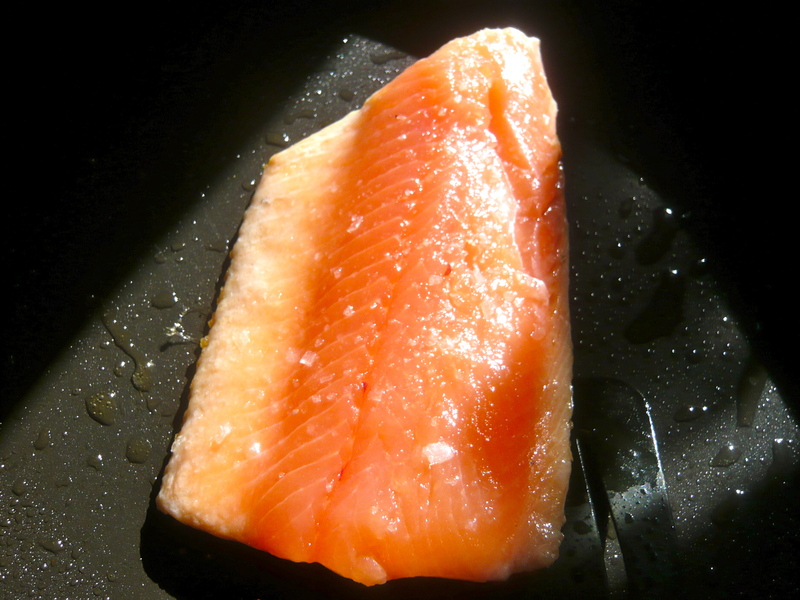 Put a non-stick pan on a high heat, brush with olive oil and lay the fillet into it skin side down. Cook until crispy and turn over the fish and turn off the gas. When I first moved to southern Europe the first sign that Spring was upon us was the mountains of broad beans that arrived at the market. After four months of root vegetable and spinach something in a pod had landed. 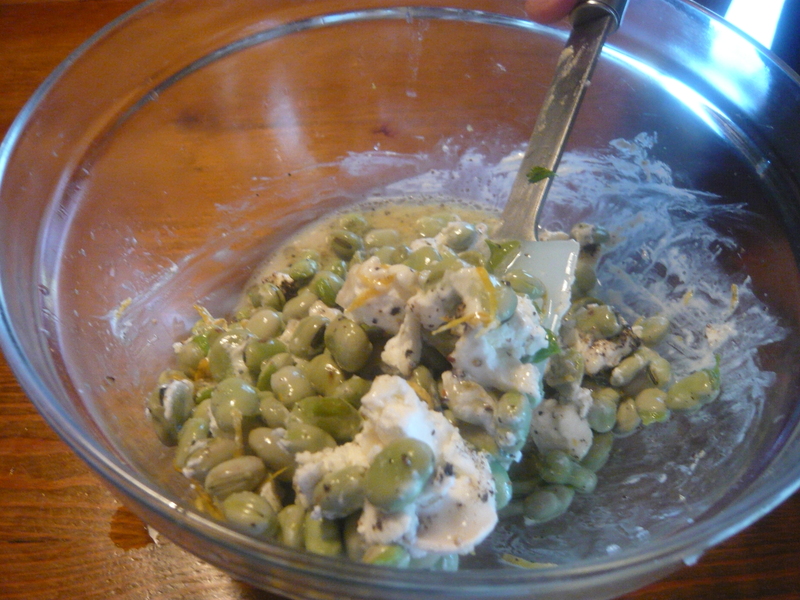 The goats cheese melts into the warm beans to create a smooth creamy sauce without using cream. The cheese gives enough salt so there is no need to add more. 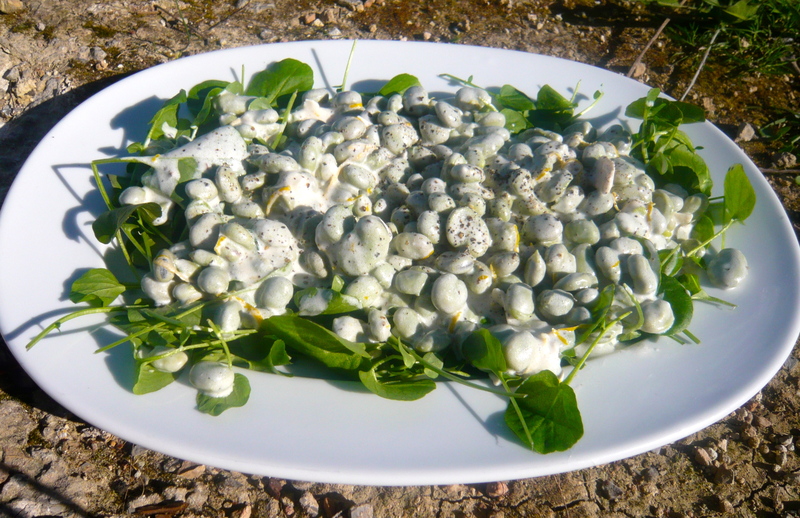 If you can’t get watercress then rocket will be fine, you can use baby gems if that is all you can get as they are firm and hold the warm beans well. Watercress is preferable as it adds a depth of flavour from its pepperiness. If you haven’t got a zester then I highly recommend that you get one, you can go ahead with this recipe anyway without zesting and buy one next time you see one. Cook off the beans in boiling water for about five mins. Whilst they are cooking break up the cheese into small pieces and put into a bowl, zest the lemon into the bowl with the cheese, grind the black pepper and add the olive oil . 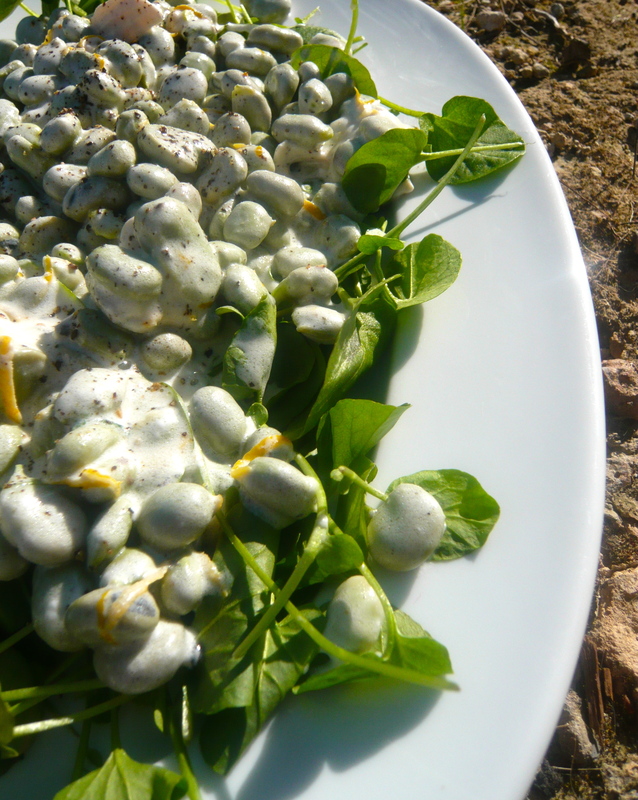 Lay out the watercress onto a large plate and taste the beans to make sure they are tender. Drain the water off when they are ready and pour into the bowl. Gently start folding the ingredients together until the goats cheese has melted and you have a even consistency. Pour the mix onto the leaves and finish with some more black pepper. You don´t have to eat this straight away, it can sit for a while. There is a sea of change about what we are eat and how we go about living. ‘You are what you eat’ has never been more of an informed notion than it is today. This change is genuine as it is from the underground rather than orchestrated by large food manufacturers and corporations. As more and more information has become available certain theories are accepted as fact regarding what we eat and what that food is doing to our bodies, our minds and the planet. ‘Health food’ as a genre can have an air of mystery surrounding it – unusual ingredients, faddy preparation and costly equipment. As a general commodity it is relatively new to the world of food. It has slowly ascended from a small minority of people in the sixties to an established position in the market where it holds its place now. It has captured the imagination of health-conscious people cutting itself a wide and rapidly expanding demographic. In the food media ‘healthy eating’ has made a limited impact. It comes across as bland and boring. This is the kind of food you eat when you are dieting. I couldn’t disagree more. I have been lucky enough to have had a blank canvas working with ‘The Healthy Holiday Company’. It has been a process of hard work, digging deep to understand how to make health food and healthy eating as tasty and as enjoyable as the other cuisines that surround us. Michael Arthur Food blog will work up through the basics. From juices and dips to entire creative meals that you can do at home. The ‘Store Cupboard’ will include nutritional information on essential ingredients for your larder; Tips will show you shortcuts and secrets to preparing side dishes and condiments to complement your food. 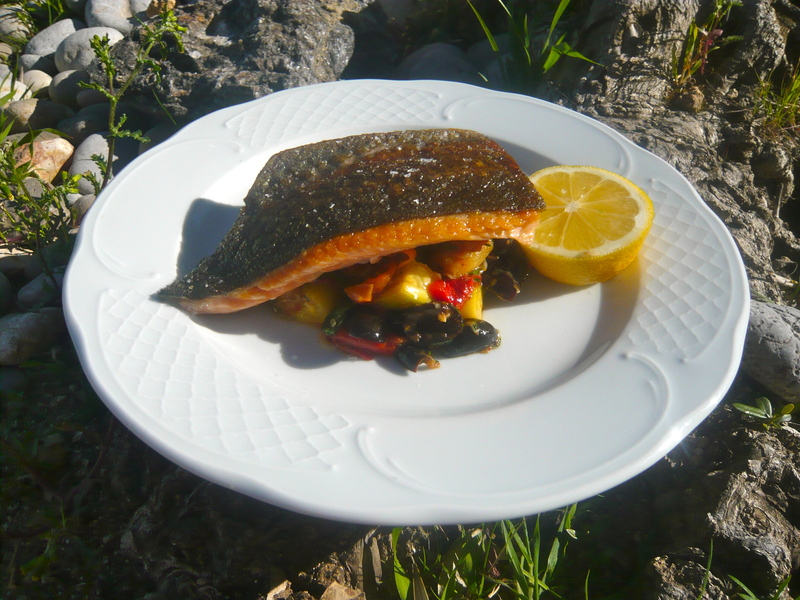 Then there’s the Recipes – straightforward, tasty, colorful and nutritionally balanced dishes. Savory and Sweet, gluten free, sugar free and low sugar options. Recipes will only use sheep or goat dairy, vegan and vegetarian ideas will be covered as well. You don’t need to be running 10k a day and hitting the gym four times a week to be healthy. There is no better way to start adopting a healthy lifestyle than changing how and what you eat. Here you will find some practical and delicious ideas to get you started. You won’t look back.